After reading Rob’s report on his effort in this race last year, I had decided that this might be my next race challenge. Having not run a marathon distance and having ruled out attempting a road marathon, this race seemed very tempting. As a family we have spent a lot of time in the Aviemore area but with young children never get to venture far into the hills. Rob’s description of some of the ‘challenges’ he faced was not quite enough to put me off! 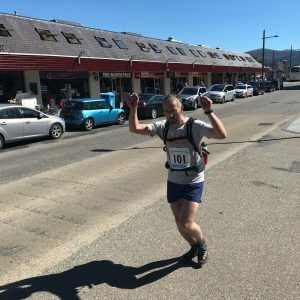 The route runs 43 kilometres through the Cairngorms, from Braemar police station to Aviemore police station, with 640m elevation and some of the most amazing scenery and views! So when entries opened earlier this year, I had decided I was going for it, along with a few other Harriers. 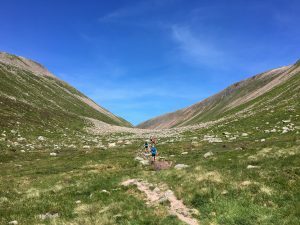 As race weekend approached, a combination of illness, injury and circumstances sadly resulted in a smaller group of us Harriers heading to Braemar, i.e. me, Al Hind and Duncan, who had managed to get a last minute place. Rob – I am sure you will be there next year and your memories of last year’s race will have faded entirely!! I am very glad that I had some Harriers buddies there, as real nerves set in as Scott and I drove up on the Saturday. The focus of my nerves had shifted from the distance to cover etc, to the weather forecast for unbroken sunshine and temperature in the mid 20s. I was beginning to wonder ‘what on earth am I doing?!’. We arrived mid afternoon and after a brief interview with the lovely Adventure Show people, we booked in to our B & B and met up with Lori and Ritchie for dinner (lots of it!) and one wee glass of wine. As promised, we woke to gorgeous sunshine and the lightest breeze. I managed to shovel down a half – decent breakfast and then got ready to head to registration, kit check and the start. Duncan and Al had come up that morning and were there, both looking a tad nervous too. 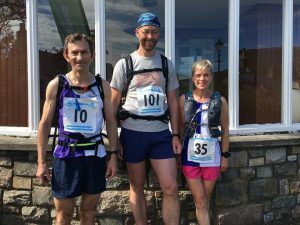 There were a few familiar faces amongst the runners, but so many looked like elite marathon or ultra runners – cue more nerves jangling. 10am came and we were off! The nice thing about the longer distance is that there is no need to sprint off at the start (unless you are Rob and looking for a photo opportunity :-)). So for the first few kilometres on the road I settled in to a half decent pace and felt very comfortable despite the rising temperature. I had a catch up with one of the lovely HBT ladies Cat, who I’m used to battling with in hill races, and managed to distract myself from worrying about the mileage and the challenges ahead. 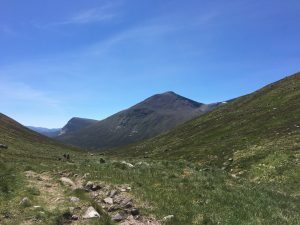 I was happy to get off the public road soon after and on to the track at Mar Lodge, and enjoy some slightly more varied ground. However, along here I realised that we had all acquired our own team of what I affectionately call ‘cheerleading’ flies. Oh my god, they just would not go away, and with no breeze they just carried on with us for miles!! The other issue at this point was that I’d managed to tie one lace too tight and had a dead foot. I reached Derry Lodge at 1 hour 15 (1 h30 cut off), and had to take my shoe off and revive my poor foot. Rooky mistake! We had no problems with crossing the Luibeg burn as it has been so dry lately, but it was nice to have a paddle at this point as the heat was difficult to ignore. After this, the route climbs and was really enjoyable, especially as the flies seemed to have given up the chase. The trail became more technical later on, and my pace began to drop quite a bit. You can also see where you are heading and I began to wonder about why I’d thought I could manage this – it went on forever. I had not taken any photos at all so far, so as we approached the boulder field, I stopped briefly and took one of the view ahead and one of the where we’d come from. It was worth stopping to look at the scenery, just absolutely stunning!! I had been worried about the boulder field but although it was challenging, it was not as bad as I’d imagined and I quite enjoyed this part. There was a drone filming us overhead, and an Adventure Show camera man filming our feet as we hopped balletically from rock to rock (at least that’s how I imagine we looked :-)). At the far side, the pools of Dee looked incredibly tempting as the heat now was definitely taking its toll, plus the lack of breeze. However, if I’d stopped again here, I might never have left! I’d also for some reason thought that the next part would become more runnable but it was way tougher underfoot than I’d imagined. I had to have a wee chat with my negative thoughts and focus on not falling over. The nausea had also firmly set in, and it was getting harder to force down the tailwind or water. I also remembered the warning from those who have done the route that you can see Aviemore from many miles away and that it’s best not to think about the distance! There was another cameraman who asked how I was doing, but I hadn’t noticed him and just muttered something like “good to see you” – oh dear…. At this this stage, a few of us were running in a little group which really helped me and the pace suited too. I did then manage to pass a few runners as we began to head downhill, and then came across Duncan sitting on a rock. He had succumbed to the crazy heat and all I could do was walk with him to the next marshal checking our numbers and then leave him to keep walking slowly down. There were a number of heat casualties on the day. I was very glad to reach the Rothiemurchus forest trail which gave a bit of shade at times and was nice running underfoot. I felt briefly stronger here and picked up the pace. There were a couple of lovely marshals somewhere around this point who had some water for us, but one of them said something about “only about 50 minutes running to go”. For some reason, that number made me feel suddenly like I could not possibly run another 2 minutes, let alone 50 – so I had my second mental meltdown. Thankfully it was a brief moment of darkness, and my legs were working just fine so I shuffled on. 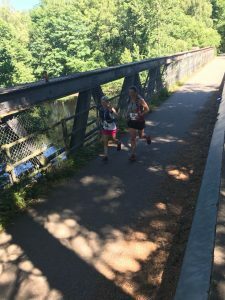 I caught up with one of the ladies I had been running with earlier and we reached the road at Coylumbridge and ran to Aviemore and the finish together. Scott had walked to the last bridge to take photos and we were just about able to smile and wave. I have never been quite so glad to see the finish and we had a comical moment of trying to decide which of us would run through the finish first. All thoughts of placings had clearly left us as were both just so relieved to be there! I had a brief teary moment on my own at the finish, just so glad to have made it. I could not quite face the amazing array of cakes supplied by the lovely Mountain Cafe people, so had some soup instead. Al came in to the finish a little later, also very glad to be done but also slightly broken by the heat. We sat with our soup, along with many other dehydrated souls, waiting for Scott to bring Duncan back from where the route joined the road. Unfortunately poor Duncan then had to get on the race bus back to Braemar and drive from there. Safe to say this was a year for finishing and not for PBs, and I felt very lucky to have made it to the start line injury free. I was more than happy with my time, as I’d hoped for around 5 hours. Will I be back next year? Absolutely!! I hope a few of us, especially those who had to pull out this year can make it too. Well done everyone, a tough race anytime never mind the heat you had to endure. I spent Sunday afternoon in a beer garden thinking about you all, I think I might have had the better deal. PBs all round next year? Wow, that was a challenge & a half and quite an achievement to get to the finish, well done guys and Duncan, hope you’re on the mend. Gillian, I see you had a wee “warm down” at Dollar too…………………. Congrats to Gill and Al for surviving the race on such a warm day. Sorry to hear about Duncan. Great report Gill, it’s a great bit of country, I’ve been over bits of it but not on the same day. Well done all! Yip, could have done with a wee cafe somewhere in the middle :-). Next year will be epic :-)!